In the standard-issue American brewery, the brew kit is a technical marvel designed to make chemical reactions happen within precise specifications—this is as true of the plant in St. Louis as it is at the brewpub around the corner. When building an American brewery, people think of chemistry, not history. But elsewhere in the world, in places where beer has been brewed for centuries, many breweries see their gleaming copper tanks as tools of preservation, not just enzymatic conversion. You find weird practices, like decoction mashing (Czech Republic), turbid mashing (Brussels), carbonation with recaptured CO2 to Reinheitsgebot-compliant (Germany), and in London, a thing called parti-gyle brewing. Back in the olden days, brewers didn’t know that much about chemistry or microbiology. They understood the basics of mashing, but didn’t know which enzymatic conversions were happening at certain temperatures. Even if they had known, they wouldn’t have been able to control temperature, anyway (the thermometer wasn’t adopted until the 1760s). That’s where various oddball mashing schemes were invented. In parti-gyle brewing, a brewery would pack the mash tun full of malt and then draw off multiple worts (“gyles”). In popular understanding of the technique, the first wort would make a strong beer and the second would make a “small” beer. That kind of linear wort-collection was practiced—Belgians regularly made multiple worts, too—but in parti-gyle brewing, the worts are later blended, producing beers of differing strengths, but not strengths identical to the worts. It’s possible that a brewery here or there still dabbles in parti-gyle brewing, but no one makes it such an integral part of its process as London’s Fuller’s. It’s the process Fuller’s uses to make its three flagship beers—Chiswick Bitter, London Pride, and ESB (along with a rarer specialty beer, Golden Pride). All of them come from the same mash and go through a boil with the same hops and hop schedule; their distinctiveness comes from the blending of wort. They boil the strong and weak worts separately, adding hops at the start and end of the 60-minute boil. “So we now start proportioning the wort to make the beers,” Young explains. “We know the target extract, so all we have to do is calculate how much first wort and then second wort is needed to achieve 260HL in each fermentation vessel at the correct original gravity.” And from these two worts come the four beers, in strengths of 8.5% (Golden Pride), 5.9% (ESB), 4.7% (London Pride), and 3.5% (Chiswick). I know that among the avid beer fans of London, Fuller’s is not considered a happening brewery (although I think it is broadly admired for taking risks and reaching out to the proliferating new breweries). For my money, London Pride is one of the finest beers brewed in that or any country, and if I could teleport myself to, say, the Jack Horner for a pint and pie, I would do so at least once a week. Cask ales are made spectacular by subtle degrees, and London Pride has a balance of flavors—soft, nutty malt, stiffening minerality, apple esters, and citrus-to-marmalade hops—that make it a perfect bitter. As Keeling says, the parti-gyle system has the benefit of being especially efficient—but I still have a hard time believing that’s the reason Fuller’s still uses it. These old practices have a way of sticking around, and the more important reason they do is because no one can argue with the beer they produce. In the late 1970s, owners of Fuller’s recommitted themselves to making exceptional beer, and began spending on modern equipment and focused on careful, precise brewing practices. 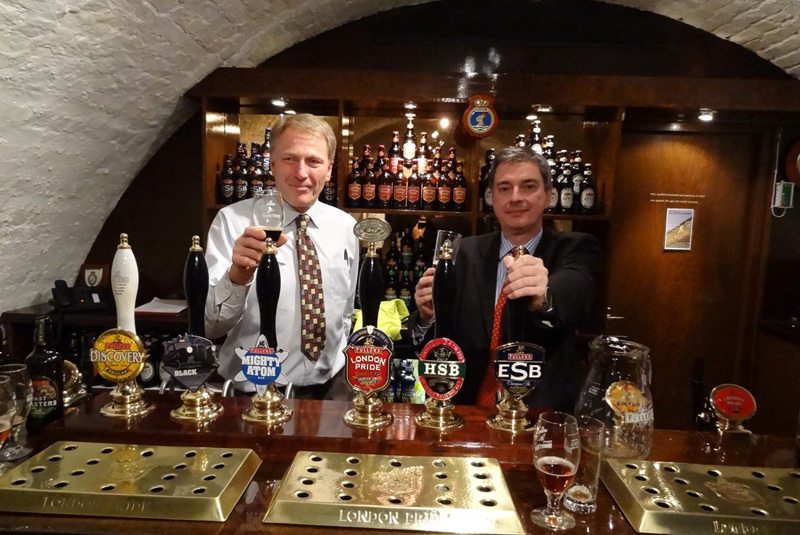 Between 1978 and 1989, the three parti-gyled bitters each won a medal as Champion Beer of Britain, the country’s most prestigious cask ale award—and ESB won it three times. They have gone on to win boatloads of awards. Maybe it is just a more practical, efficient way of making beer. (Though if so, it’s curious that no other breweries employ it.) Or maybe Keeling is just happy to keep its benefits to himself. 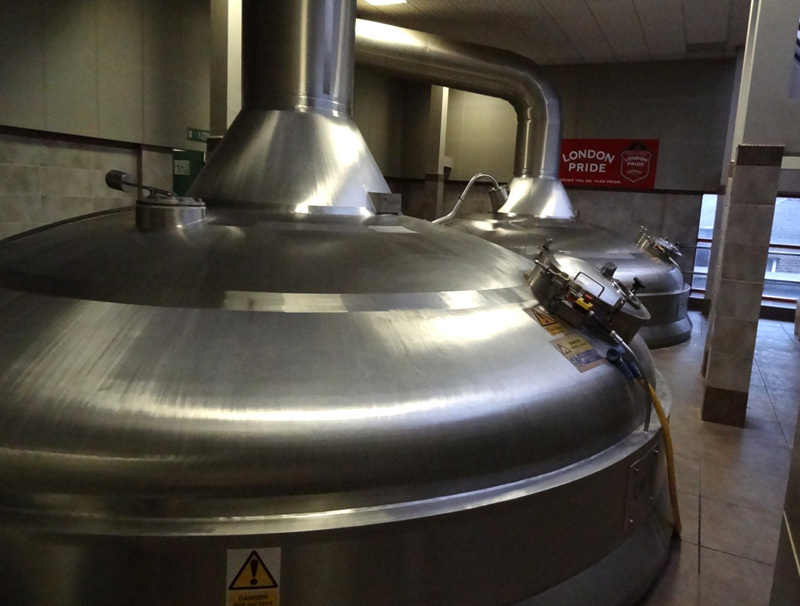 We toured the Fullers Brewery in December last year. I was already enjoying proper pints of London Pride throughout town, but having it fresh at the brewery was transcendent. I compare the experience of how amazing London Pride tasted fresh to how amazing I thought Pilsner Urquell tasted fresh in the Czech Republic. It’s hard to think of American beers that taste that different fresh, but perhaps that’s because we don’t really do cask ales (like Fullers) or serve unpasteurized, unfiltered pilsner, like having Pilsner Urquell close to the source. I think other breweries do parti-gyle, or at least used to. As I understand it the origins of it go back to when there was a limit on how big coppers could be built due to their need for heating, but not so much as to how big mash tuns could be built. So each mash would fill several coppers.